The screen shot above depicts a service record example for Sitelutions. Most of the fields in this dialog are self explanatory, but some fields require brief explanations. 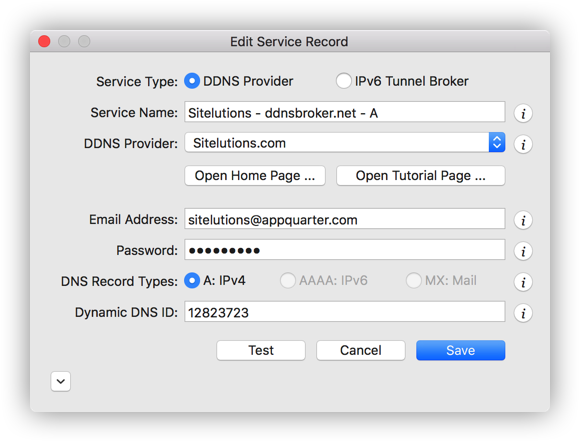 Dynamic DNS ID: A numeric identifier for your host, assigned by Sitelutions when you created a record for the host. Follow these steps to locate it. Login at Sitelutions.com using your credentials. At the top menu bar, select "Account Control", "URL and DNS" menu item. In the "Jump to a domain..." section, select the domain of interest. In the section identified by your selected domain name, locate the row for the host name of interest, select "[Advanced Config & DDNS]". Locate the A record, and select "[Dynamic DNS]". Your Dynamic DNS ID is displayed on that window. DNS Record Types: Sitelutions supports dynamic DNS record of type A.